One of our most important functions is to share the wonders of the cosmos with the people in our community and state. We do this in a variety of ways. We work diligently to encourage young people to excel in academics, most especially in science and mathematics. We work closely with schools, libraries and scouting organizations to provide opportunities for observing and learning about astronomy to children, their parents and their teachers. In addition to our work with young people we also work closely with other charitable organizations such as the Muscular Dystrophy Association to provide opportunities for fund raising and observing and education to people less fortunate than ourselves. Amateur astronomy is a great way for the physically challenged to satisfy their desires to participate in, and contribute to, our society. As the largest astronomy club in the area, we also work with other organizations such as the Science Museum Oklahoma and Odyssey Astronomy Club to enhance such organizations' capabilities of sharing the wonders of science and astronomy with the public. 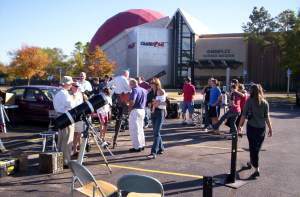 Are you interested in having the Oklahoma City Astronomy Club present a star party for your organization's event? 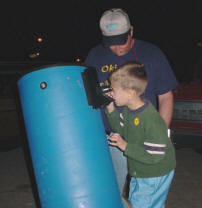 Contact the club's Observing and Outreach Coordinator to arrange a star party. We'd Also Appreciate Your Help! Any donations of material or funds to assist us with our public outreach programs are greatly appreciated! Contact our Treasurer and THANK YOU SO MUCH in advance. Your support will help us to expand our capabilities to provide educational and scientific opportunities to our community. 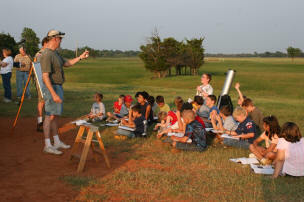 The Oklahoma City Astronomy Club is a scientific and educational organization under IRS regulations 501(c)(3). Your donations are tax deductible.